Stellar Performances at The Battle of The Bands! The 2014 State Mutual Insurance Battle of the Bands turned out to be a great time and a serious showcase of talent from great local acts. The show was at The DeSoto Theatre this past Saturday, August 9th. The Holler, The Kamikaze Dali, Awake For, and The Donors all played their hearts out and blew away the crowd. Muletide Perkins Trio kicked off the show to get the party started. The entire event was a fundraiser for Cancer Navigators of Rome, GA and raised over $11,000. The Holler took the Judges Choice Award and The Kamikaze Dali won the People’s Choice Award even though it was extremely close the entire night. Read more about the Battle on the 95.7 The Ridge Web Site. This blog is a compendium to MullinsMania.com. 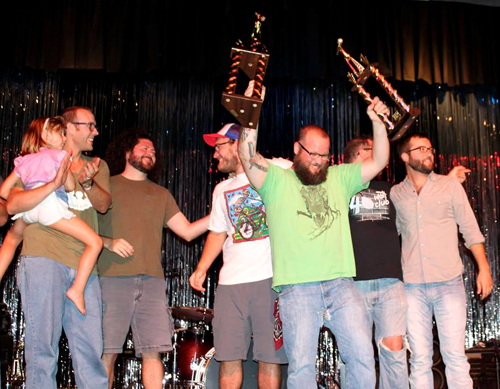 Posted in Uncategorized | Comments Off on Stellar Performances at The Battle of The Bands! You are currently browsing the The Rumpus Compendium blog archives for August, 2014.